It’s not enough anymore to have a single stereo system in your home, probably in the living room or near your TV. With smartphones, iPods, and iPads, we expect to be able to blast our favorite tunes at high volumes in any room in the house. Accomplishing this requires either a sound system for every room in your house or apartment, or a portable device that can be carted from room to room without much hassle. This new speaker dock from iLuv offers plenty of useful features and was designed with home and kitchen use in mind, even if you plan to carry it from room to room so you’re never without your favorite song. The iLuv Mo’Beats iSP245 ($100) has a painful name but we think the design is actually quite clever. 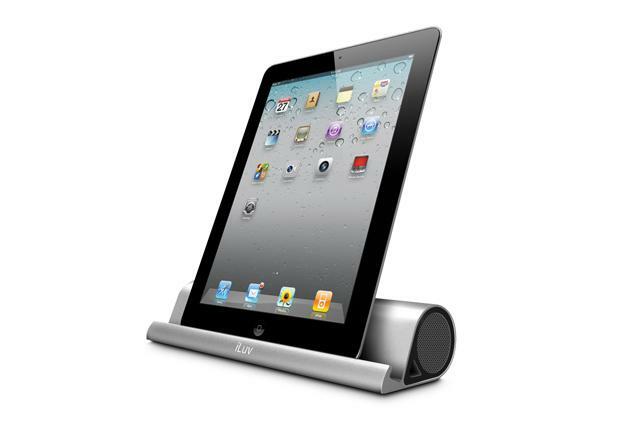 The speaker dock, which uses Bluetooth to easily stream music from your device (iOS or otherwise) to the speakers, has a cylindrical design with two high-fidelity speakers on either end. We like the sleek Apple-like design, and that little lip in the front might be the best feature at all. Many speaker docks that let you steam via Bluetooth don’t leave you anywhere to put your phone or iPad while it’s in use. The Mo’Beats dock, on the other had, features a nice cradle in front of the speakers where you can prop up your iPad, iPhone, or other device to easily view and use it while it’s doing the streaming legwork. Check a recipe while you’re in the kitchen, easily watch a video, or make a speakerphone call with your device propped in either horizontal or vertical viewing position. The dock runs on a rechargeable lithium-ion battery for added convenience and portability, and if you don’t want to use the Bluetooth feature, there’s an aux-in to play music from almost any device. The dock isn’t out for sale yet, but word is it will be available soon.